A weed eater will help you keep your lawn looking its best all spring and summer long. From creating neat edges to trimming grass and other plants near objects, there’s no better way to keep your yard looking tidy. Using a weed trimmer is easy. Finding the right one to buy is the hard part. With so many options to choose from, it’s easy to get overwhelmed. Gas, Electric or Battery: There are three types of trimmers on the market – gas, electric and battery. Electric and battery have the benefit of not producing any emissions, but are limited. Electric models require extensions cords to reach the entire yard, and battery-powered models run out of juice quickly. They’re not as powerful either. Gas may produce emissions and may run loudly, but it’s the best option overall. These models are powerful, and they still give you the freedom of being able to move around the yard without having to worry about cords. All of the models we’re going to be reviewing are gas powered. Weight: Some trimmers are heavy, but most modern models are relatively lightweight. Keep weight in mind when comparing models. You’ll be using the trimmer for quite some time, so make sure that it’s not so heavy you can’t finish the job. 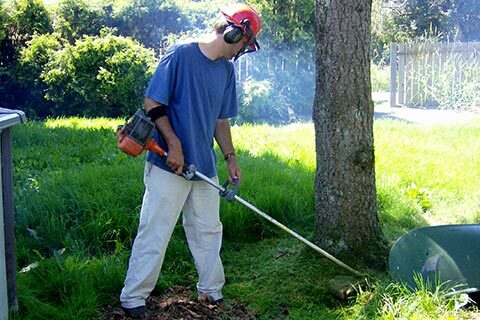 Quality: Weed trimmers can be expensive, so you want to make sure you’re making a good investment. One way to gauge the quality of a particular model is to check out user reviews. You can also research the brand to learn more about its reputation. Husqvarna 224L – The Husqvarna 224L is – hands down – the best gas weed eater you can buy. 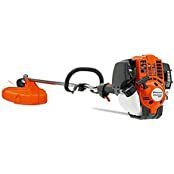 Equipped with a 25cc 4-stroke engine, this trimmer is surprisingly lightweight at 11.24 pounds. And its unique design eliminates the need to mix oil and gas. Starting up is easy thanks to the air purge system, which removes air from the fuel system and carburetor. The built-in Smart Start system allows this trimmer to get up and running with minimal effort on your part. Quiet, lightweight and easy to use, the 224L is ideal for any household and any user. And with the easy start system, you’ll never have to struggle to get your trimmer started. Poulan Pro 966774301 – The Poulan Pro trimmer is affordable and easy to use. With a 28cc 4-cycle engine, this model is powerful enough to tackle tough jobs, and the 17” cutting width allows you to take on bigger trimming tasks with ease. There’s no need to mix oil and fuel with this trimmer, and the spring assisted smart start makes it so easy to get this trimmer running. Incredibly versatile, this trimmer features a split boom shaft and Pro-Link attachment system. This system turns your trimmer into a multi-function outdoor tool. You can purchase attachments separately, including: cultivator, blower, pole pruner, brush cutter and edger. If you’re looking for a multi-function trimmer, the Poulan Pro is a great choice. Troy-Bilt TB525 Curved – What sets the Troy-Bilt TB525 apart from the other gas trimmers on our list? Its curved shaft. Unlike traditional weed trimmers, the TB525’s curved shaft offers a more balanced feel, so you can use it for longer without feeling overly fatigued. The curved shaft also gives you a complete view of the cutting line, allowing for precision trimming. A 29cc 4-cycle engine gives this model plenty of power, while the JumpStart and SpringAssist ensure that this trimmer is up and running in no time. The 17” cutting swath can tackle big jobs with ease, while the two bump head SpeedSpool allows for quick and easy loading of up to 20 feet of line. Like the previous model, this trimmer can also use attachments to boost its versatility. Troy-Bilt TB575 Straight – The TB575 Straight is identical to the previous trimmer, but features a straight shaft instead of a curved one. If you like all the features the TB575 offers but aren’t fond of the curved shaft, this variation may be the right choice for you. Equipped with a powerful 29cc 4-cycle engine, this gas trimmer can tackle the toughest of jobs with ease. And its large cutting swath means you can clear large areas quickly. The straight shaft design also makes it easy to reach under bushes and shrubs for easy trimming. The SpeedSpool head makes it quick and easy to load up 20 feet of line, and the JumpStart engine helps get this trimmer running in seconds. Poulan Pro 966774201 – The final pick on our list is also from the Poulan Pro line-up. The gas-powered 966774201 is equipped a 28cc 4-cycle engine that’s powerful enough to take on tough, thick weeds with ease. And the 17” cutting swath makes quick work of big jobs. The spring-assisted start system makes it easy to get this trimmer started. And the 4-cycle engine eliminates the need to mix gas and oil. The split boom shaft features the Pro-Link attachment that transforms the trimmer into a multi-function tool. Attachments can be purchased separately, including: cultivator, blower, pole pruner, brush cutter and edger. If you’re looking for a versatile trimmer with a powerful engine, the Poulan Pro 966774201 is a great choice. Shaft Design: Some trimmers have a straight shaft, while others have curved. Curved models are great for improving balance and also allow you to get a better view of the area you’re trimming. Straight shafts can easily reach underneath bushes and shrubs for precision trimming. Engine Power: Consider the type of weed whacking you’ll be doing. If you have tough weeds that you need to cut through, you’ll need a trimmer with a powerful engine. A 28cc or 26cc model is a great choice and will be able to take on most jobs with ease. Versatility: Many newer trimmers have attachment systems that allow you to use the trimmer for other tasks, like leaf blowing and edging. These attachment systems are incredibly convenient because you can get multiple tasks done with just one tool – not five or six (or more). If you spend a lot of time doing yard work, a model with an attachment system may be the better option for you. Start-up System: At one time, gas-powered tools were a pain to use. To get started, you had to pull a string. Sometimes, it would take five or ten strong pulls to get it up and running. Now, modern trimmers have easy-start systems that make it nearly effortless to going. Price: Finally, you’ll want to consider the cost of the weed whacker. When it comes to lawn equipment, a higher price typically equates to a higher quality product. Still, you should set a budget and stick to it when buying a trimmer – some models can be pricey.